Photograph of the entrance porch and mandapa of the the Shiva Temple at Gehraho, Jhansi District, part of the Archaeological Survey of India Collections: Indian Museum Series, taken by an unknown photographer around the 1880s-90s. The district of Jhansi in Uttar Pradesh was ruled by a succession of dynasties under several different names, the most noted being the Chandella kings who ruled from the 9th to the 12th centuries. 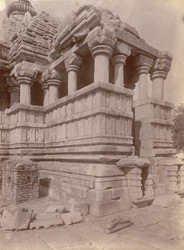 The majority of the Hindu and Jain temples that remain date to this period, as does the temple in this photograph, built during the reign of the Prince Kirttivarman. The central hall in this Shiva temple is open at the sides and has seats that run the full edge of the space that are backed by sloping parapets. The sanctum contains a lingam made of black basalt, called Guraiya Mahadeva.